Coastal landscapes are often spectacular, with dizzying cliffs or mighty seas, but there are a few locations which are in a different league. Every so often, that section of coast looks like the world is about to end – usually because of an active volcano. Although there are many worthy volcanoes on other coasts, particularly around the Pacific ‘rim of fire’, the volcano most favoured by artists is Mount Vesuvius, which sits brooding over the city of Naples from the middle of the Bay of Naples, in the Mediterranean. We know a great deal about its successive eruptions for the last two millenia of its 25,000 year history as an active volcano: in 79 CE, it overwhelmed several Roman towns including Pompeii, burying their inhabitants in tombs of ash and rock. Since then, Vesuvius has erupted dozens of times, and at present more than half a million people live in the ‘red zone’ which is at greatest risk of flows of molten lava. The volcano has long been a tourist attraction, and since 1880 visitors have been able to travel up to its summit in a cable car. 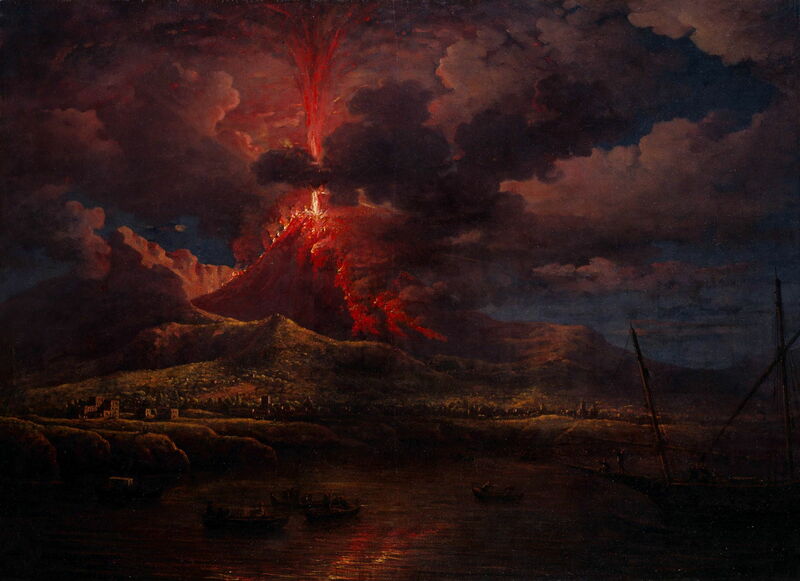 Vesuvius has also brought artists from all over the world, to draw and paint it, particularly during an eruption. Many of the paintings which I show in this and the next article were made to sell (as originals or prints) to visitors, which has been a long-running industry in the city of Naples. 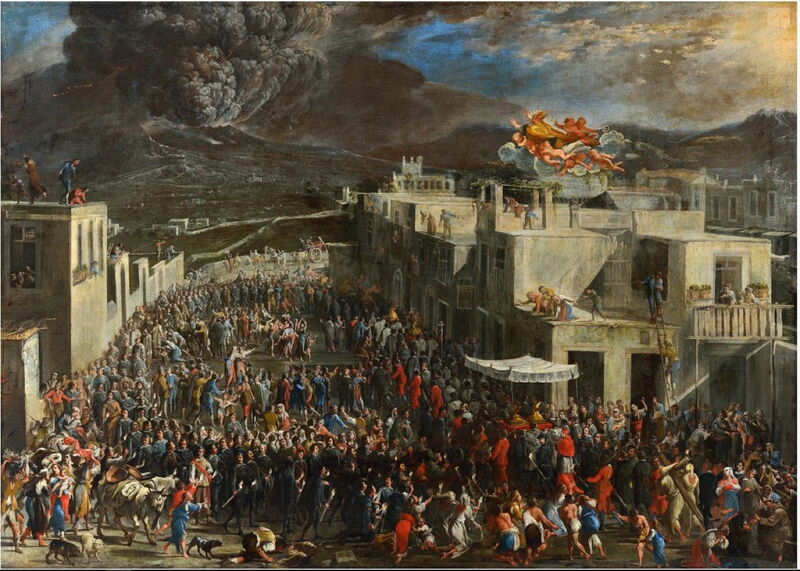 Domenico Gargiulo (1609–1675), The Eruption of Vesuvius in 1631 (1656-60), oil on canvas, dimensions and location not known. Wikimedia Commons. Domenico Gargiulo was a young artist when Vesuvius erupted a week before Christmas in 1631, and his painting of The Eruption of Vesuvius in 1631 is thought to have been made rather later, in 1656-60. His painting captures well the dense, toxic plume of smoke and gases emitted from the volcano, but is dominated by the human effects on one of the nearest towns. The majority of the population seem engaged in a religious procession around the centre of the town, with a few taking to the rooftops to spectate. There’s even a small group of rather pagan-looking gods watching the scene from their cloud, probably a reference to the classical mythology of Vesuvius. 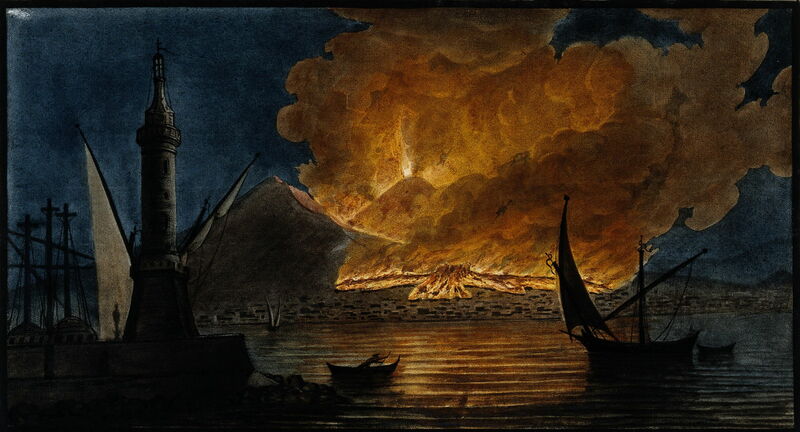 Pietro Fabris (before 1740-1792), Vesuvius in Eruption in 1767, from the Mole at Naples (1776), coloured mezzotint after original painting of 1767, 21.4 x 39.5 cm, Wellcome Library, London. Courtesy of The Wellcome Library, via Wikimedia Commons. As the idea of travel for cultural exposure and improvement became more popular into the eighteenth century, so artists started to capitalise on wealthy visitors. Pietro Fabris is one of those who started making paintings, such as his Vesuvius in Eruption in 1767, from the Mole at Naples, which had probably been made in front of the motif in 1767, and was then turned into this coloured mezzotint nine years later. It shows the eruption of Mount Vesuvius on 19 October 1767, which lasted just over a week. 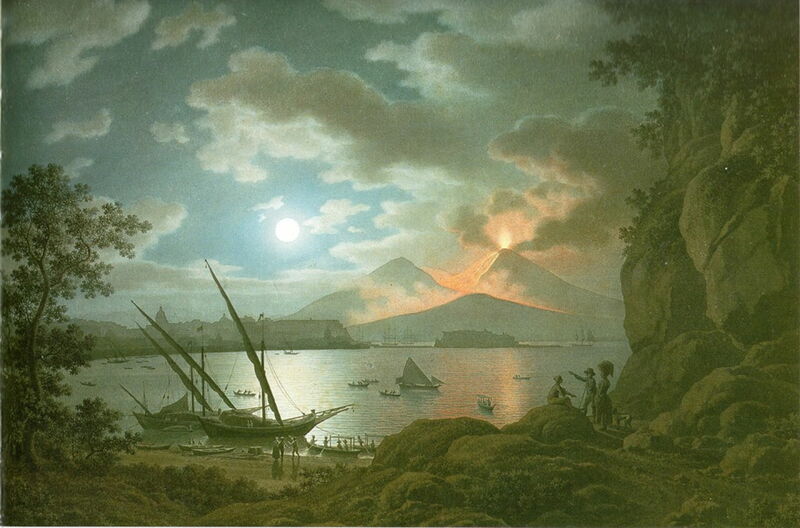 Fabris was one of the early artists to realise that the visual effects would be greatest at night, and to employ an ingenious view and composition which superimposes the silhouettes of boats against the fire and flames of the lava flows. He also made good use of the third element available at the coast, by showing the fire reflected on the surface of the Bay of Naples. William Marlow (1740–1813), Vesuvius Erupting at Night (c 1768), oil on canvas, 91.5 x 127 cm, location not known. Wikimedia Commons. William Marlow’s Vesuvius Erupting at Night from about 1768 must have been based on the same eruption in 1767. Marlow is sadly little-known now, and was a British landscape and marine painter most active in the decades before the arrival of the young JMW Turner. Pierre-Jacques Volaire (1729–1799), Eruption of Vesuvius on 14 May 1771 (c 1771), media and dimensions not known, Kunsthalle Karlsruhe, Karlsruhe, Germany. Wikimedia Commons. Pierre-Jacques Volaire was a French landscape artist, a pupil of Vernet, who moved to Rome in 1762, and on to Naples five years later. His painting of Eruption of Vesuvius on 14 May 1771 (c 1771) is one of a series which he made covering eruptions from 1767 to 1782. He was also more innovative in his choice of view: here he has approached the lava flows and looks west across the Bay of Naples. This brings the moon into view, and provides contrasting colours. The eruption which started on 1 May 1771 was long enough, lasting a whole month, to attract many painters to depict it. Pietro Fabris (before 1740-1792), Lava Emerging from Mount Vesuvius at Night and Running towards Resina, 11 May 1771 (1776), coloured etching after original painting of 1771, 21.2 x 39.1 cm, Wellcome Library, London. Courtesy of The Wellcome Library, via Wikimedia Commons. Among others, Pietro Fabris caught its spectacular lava flows, in his Lava Emerging from Mount Vesuvius at Night and Running towards Resina, 11 May 1771, seen again as a coloured etching made in 1776 after his original painting of 1771. Jakob Philipp Hackert (1737-1807), The Eruption of Vesuvius in 1774 (c 1774), oil on paper mounted on wood, 61 x 87 cm, Private collection. Wikimedia Commons. The long eruption and lava flows of 1771 were but a precursor to an active year in 1774, which started just before the year did, and rumbled on until 1 December. 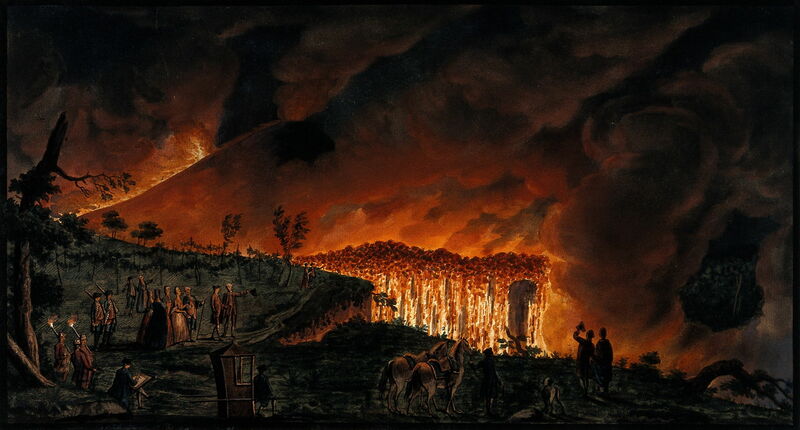 Jakob Philipp Hackert shows one of the more localised events in The Eruption of Vesuvius in 1774, painted in that year or shortly afterwards. Michael Wutky (1739–1822), Eruption of Vesuvius (1772-85), media and dimensions not known, Kunstmuseum Basel, Basel, Switzerland. Wikimedia Commons. 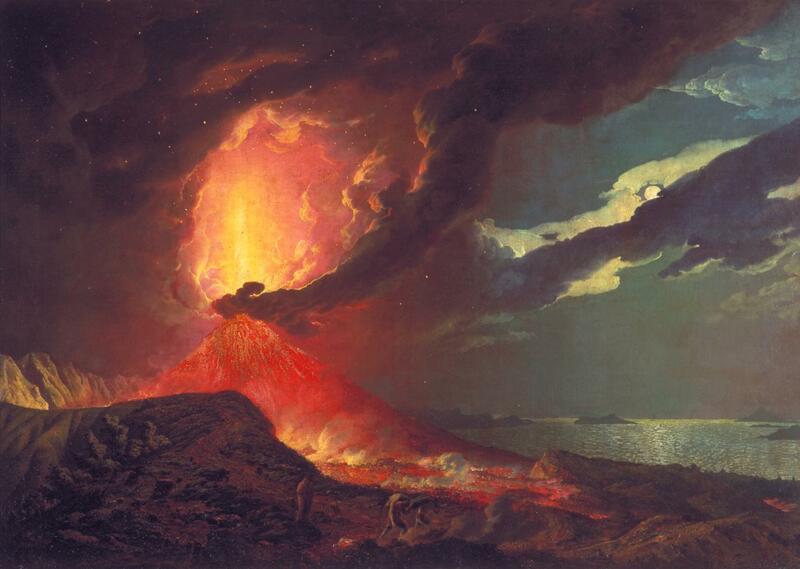 At some stage between about 1772 and 1785, Michael Wutky seems to have seen a more vigorous Eruption of Vesuvius, although it was not so large in scale that he was prevented from approaching the source of lava and smoke. 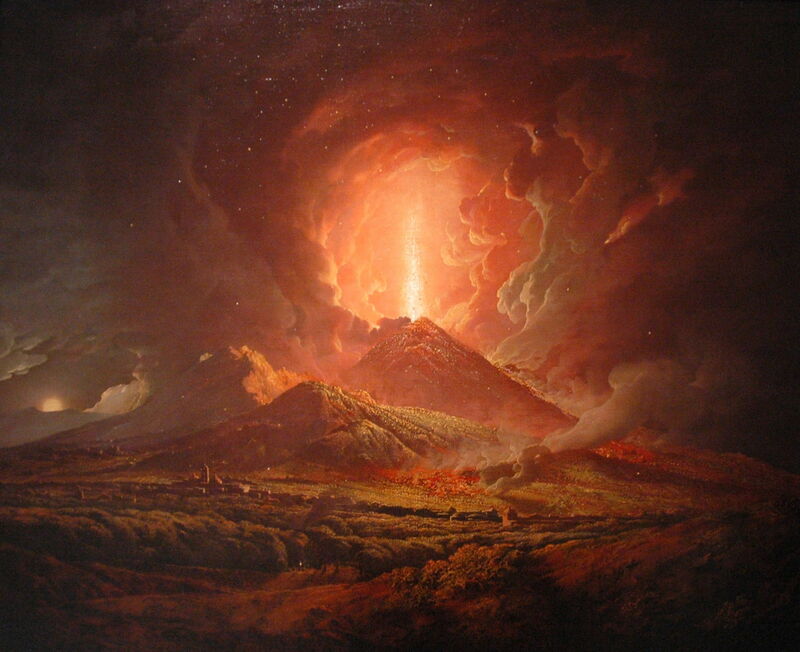 Among the artists from further afield who was drawn to Vesuvius was the British painter Joseph Wright of Derby. He travelled to Italy in 1773 to paint landscapes there, and made his way to Naples late in 1774, as its year of activity was petering out. Wright returned to England in 1775, and therefore is not thought to have witnessed any forceful volcanic activity during his visit. Joseph Wright (of Derby) (1734–1797), Vesuvius from Portici (c 1774-6), oil on canvas, 101 x 127 cm, The Huntington Library, San Marino, CA. Wikimedia Commons. 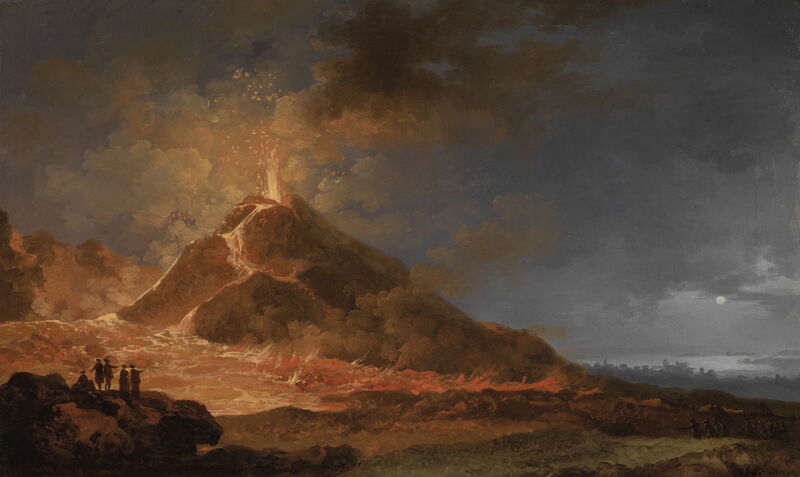 Yet Wright became almost obsessed with painting views of violent eruptions, such as his Vesuvius from Portici, which he may have started when still in Italy, but probably completed back in England by 1776. Wright’s Vesuvius in Eruption, with a View over the Islands in the Bay of Naples was probably painted entirely in England, and completed in 1776. He has also exercised some licence in composing this view, which includes the islands of Ischia and Procida, which could not have been visible in real life. 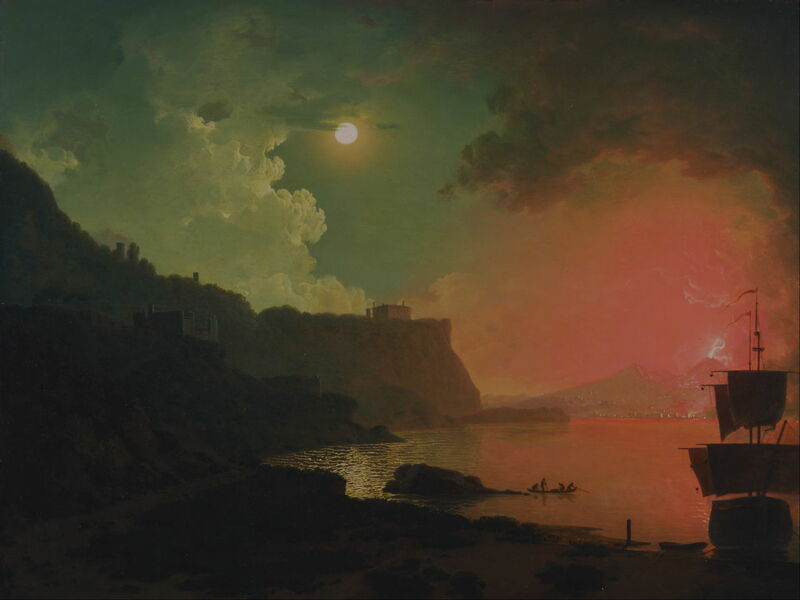 He too has used the contrasting mood and colours between the eruption at the left, and the peaceful moonlit coast at the right. Joseph Wright (of Derby) (1734–1797), Vesuvius from Posillipo (c 1788), oil on panel, 63.5 x 83.8 cm, Yale Center for British Art, New Haven, CT. Wikimedia Commons. More than a decade after he had left Italy, Wright painted this more plausible view of Vesuvius from Posillipo (c 1788), and by the time of his death in 1797, he had painted more than thirty views of Vesuvius erupting. Wright’s fascination seems not to have been particularly artistic, although his paintings were very well received, but more from the emerging science of volcanic phenomena. Giovanni Battista Lusieri (c 1755-1821) Eruption of Vesuvius, View from Naples (1792), media and dimensions not known, Private collection. Wikimedia Commons. Giovanni Battista Lusieri was another great landscape artist who was drawn to Naples. Born in Rome, he became a court painter, then documented the Acropolis in Athens for Lord Elgin. He was a superb watercolourist, and an innovative exponent of huge panoramic views, but many of his works were lost in a shipwreck after his death. 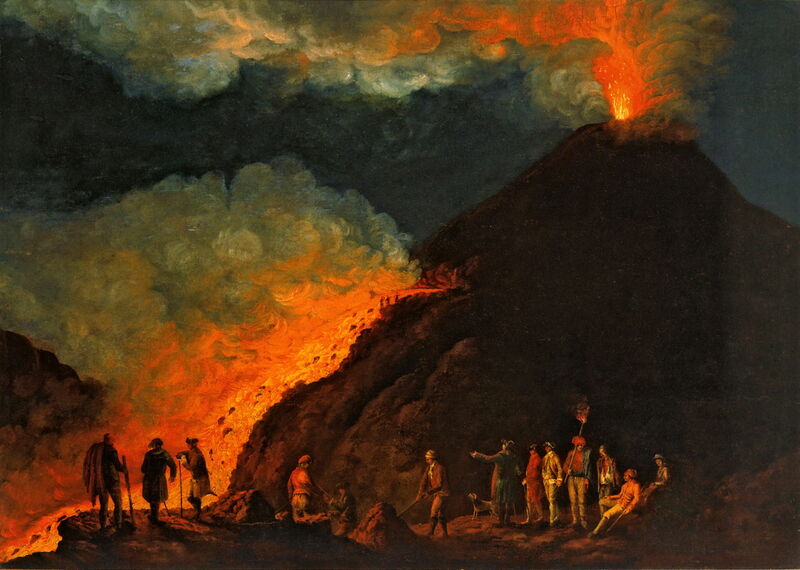 Lusieri’s Eruption of Vesuvius, View from Naples is dated to 1792, which is also a puzzle, as the eruption on which it is based must also have been that in 1774, unless the painting was made in 1794, in which case it would have shown the eruption of that later year. 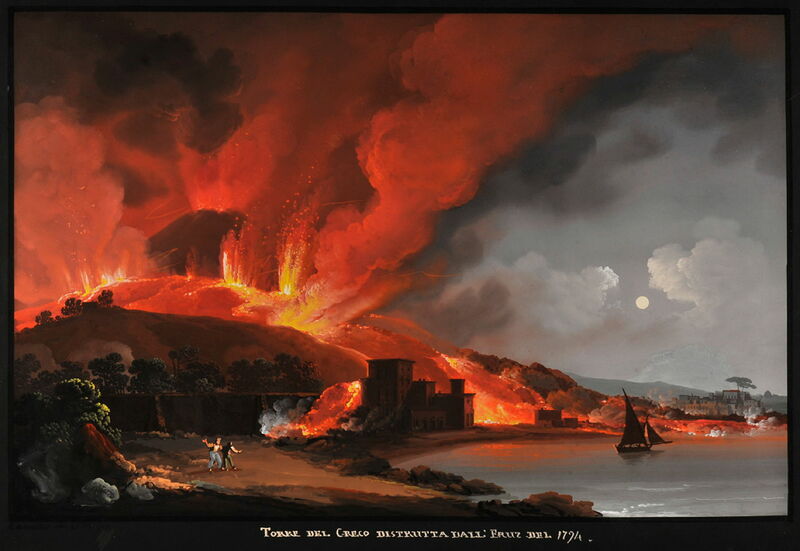 Camillo De Vito (active 1794-1845), Torre del Greco Destroyed by the Eruption of 1794 (1794), gouache, 42 x 64.5 cm, Private collection. Wikimedia Commons. 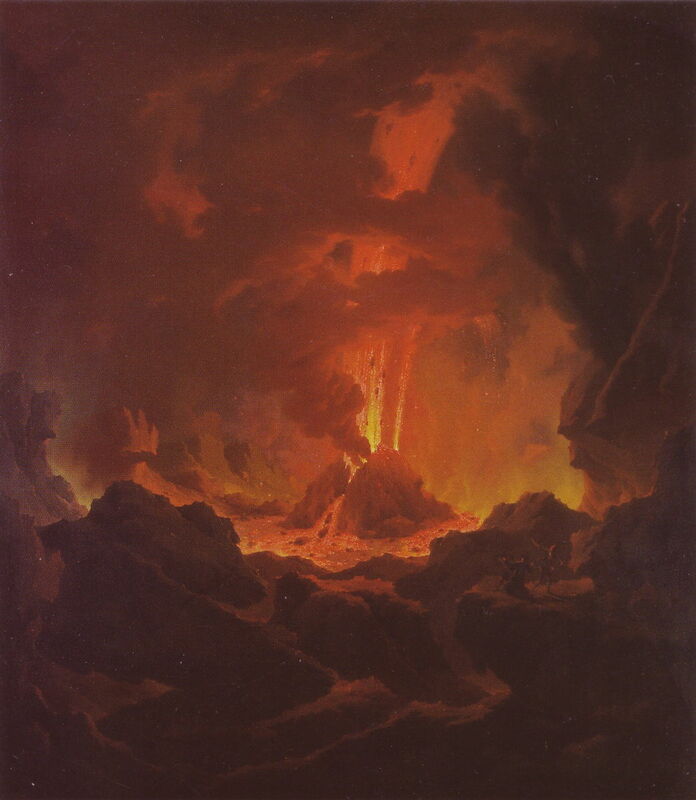 Camillo De Vito’s painting of that eruption in 1794, in his Torre del Greco Destroyed by the Eruption of 1794, is a good link to the second and final article, in which he improves upon this very promising composition, and paints what I think is one of the finest depictions of this volcano, in the nineteenth century. Posted in General, Life, Painting and tagged coast, De Vito, Fabris, Gargiulo, Hackert, landscape, Lusieri, Marlow, nocturne, painting, spectacle, Volaire, volcano, Wright, Wutky. Bookmark the permalink.